Why Are Mars' Sunsets Blue? NASA's Curiosity Mars rover recorded this view of the Sun setting at the close of the mission's 956th Martian day, or sol (April 15, 2015), from the rover's location in Gale Crater. NASA/JPL-Caltech/MSSS/Texas A&M Univ. Earth and Mars are a bit like mirror worlds. Mars is the Red Planet. Earth is the pale blue dot. Mars is a frigid desert. Earth is full of water and life. But there's another curious difference. 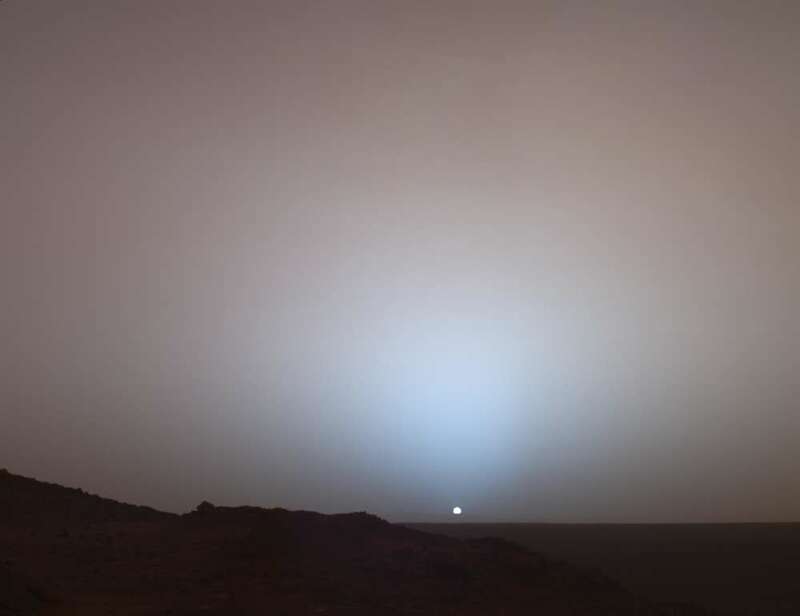 The sky on Mars is red, while its sunsets are blue. The reason behind this is similar to why our sky is blue and our sunsets are red. The light from the Sun scatters based on what’s in the atmosphere. Sunlight comprises light of many different wavelengths, and molecules and dust particles only interact with specific waves. The scattering of light by these particles is key to the color that we see. Mars’ atmosphere is very tenuous – its pressure is equivalent to about 1 percent of Earth’s. It is made of carbon dioxide and has a lot of dust. This fine dust tends to scatter red light so that the sky appears reddish, which lets the blue light through. On Earth, it is the other way around. Blue light bounces off air molecules giving our sky its characteristic hue. At sunset light has a longer distance to travel within the atmosphere, so it scatters more. What is left is the color that we see. On Earth, we have a wider palette of reds, which is actually amplified by ash from volcanoes and dust from fires. On Mars, we get a cool blue hue. Curiosity, Spirit, and Opportunity, the indefatigable robotic rovers we've sent to the Red Planet, have witnessed and recorded the curious phenomenon. Interestingly, Earth and Mars are the only two places in the Solar System that have sunsets that we can observe. Mercury lacks an atmosphere so we would see the Sun disappear while the temperature goes from 427°C (801°F) to -173°C (-279°F), as we shift from day side to night side. It also has a very long day, rotating on itself every 58 and a bit days. But going to Venus would be even worse. The thick cloud cover and extremely dense atmosphere would stop the rays of the Sun from reaching us. And the high temperature and acid rain would easily melt our suits – and eventually our faces – off. Maybe Titan could offer a rare sunset, occasionally, within its dense atmosphere. But for the time being, our Earthly sunset and videos of Martian ones are the best we can hope for.